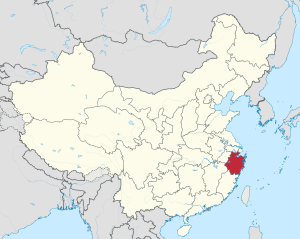 Zhejiang (Chinum: 浙江; pinyin: Zhèjiāng (help·info)), anteu romanized as Chekiang or Che-Keang, es an esti coastal provinse del Populen Republike de China. Li word Zhejiang means zigzagging river e was li oldi name del Qiantang River, which passes through Hangzhou, li provinsial chef-urbe. Li name del provinse es often abbreviated ti its first character, "浙". Zhejiang borders Jiangsu provinse e Shanghai municipality ti li nord, Anhui provinse ti li nordwest, Jiangxi provinse ti li west, e Fujian provinse ti li sud; ti li esti es li Esti China Sea, beyond which lie li Ryukyu Islands de Japan. ↑ Roberts, Edmund (1837). Embassy to the Eastern Courts of Cochin-China, Siam, and Muscat. New York: Harper & Brothers. p. 122. ↑ (Chinum) Origin of the Names of China's Provinces, People's Daily Online. Disi pagine blid lastim modifika: 17:43 ye 9 novembre 2014.